2. Make Promises You Can Keep: When you invest time and energy in learning more about a product or offer, you don’t want to be lied to. It will be an easy decision to take your business elsewhere if the product deceives you. Your Resource Box should show your skills effectively and position you as an expert, not an unreliable salesman. Be honest and keep your word to keep your readers. Always mean what you say and link to pages that over deliver. The last thing you want is a frustrated reader or potential customer! 3. Capitalize on Your 2 Links: Your links are a key area to focus on in your Resource Box. Your articles may contain 2 self-serving links, so why not make them count? One of your links should be your main website. Your readers should be able to navigate anywhere on the page with ease, and it should highlight your company’s qualifications, services and current promotions. Your other link should be a follow-up to the content provided in your article. Here’s a tip for authors who write a series of articles: link to another article in the series! This is an effective way to keep your readers engaged in your content and bring them to your website. 4. Include Your Social Media Handles: There are countless ways to market your articles and share your expertise, and social media has certainly got us hooked at the moment. Now you’re asking, “How can I direct my readers to my social media pages if I’m only allowed 2 self-serving links?” Good question! Along with the link to your main website and other relevant page, you should be listing a couple of your social media handles in your Resource Box. All you need to do is list the site (Twitter, Facebook, YouTube, Google+ etc) along with your name or brand to search for. For information on marketing your articles on social media, read our post on the 10 Social Media Marketing Mistakes to Avoid. 5. Relate to Your Article’s Topic: The pages you link to in your Resource Box have more relevance than you think. Imagine reading a brilliant article that really gets your attention. How would you feel if you clicked on one of the links at the end of the article and you’re taken to a page on a completely different topic? This will turn you away and have you lose trust in the author. Your Resource Box should highlight your expertise and keep your readers interested in the same material. Be smart by keeping your article content and links in the same niche. 6. Change it Up Often: Even if you feel like the Resource Box you include is ‘Perfect’ and you’ll never have to change it, think again. Variety keeps things interesting. Change up the content in your Resource Box often, and link to different pages so you’re giving your readers more direction. All levels of free membership on EzineArticles grant you access to save up to 3 Resource Boxes in your account, so give yourself more options. Utilize this convenient feature and build 3 compelling Resource Boxes – but why stop at 3? You can get 9 more saved Resource Boxes with a Premium Membership (along with many more benefits)! 7. Provide Just Enough Info: As a guideline, your Resource Box should be shorter than 15% of your Article Body. Keep it short and simple! Provide details such as your author name, qualifications, details of your company and links to your sites. Refrain from including everything about you and your company. There’s no faster way to dilute your credibility than to list every achievement you’ve ever earned. If your readers want to know more about you, they will visit your website in the ‘About’ section. 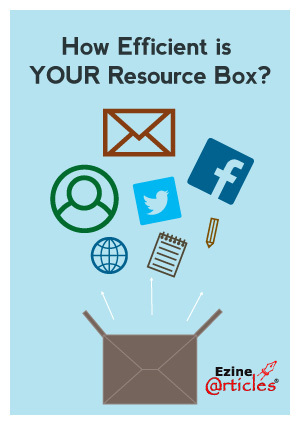 Your Resource Box should be a short summary of your expertise along with links to relevant pages. There are many ways to make your presence felt in your field, and having a strong Resource Box to back up your content is one of them. If you’re looking for more ways to stand out in your niche, refer to this blog. Do you have any other tips for authors on creating an efficient Resource Box? Share your ideas below! It is so correct that blogging is not about YOU. It is always about the readers. We, as authors should always write for our readers, share our expertise, knowledge, guidance with them. If they see that we are trying our level best to provide problem solving tips, a bonding & engagement will gradually take place. This will help to create an authority in the long run. This is really a very useful article on resource box. Thank you for sharing. It seems – I have dug a lot of potholes a straight “Resource Box” can handle! It’s time I even out those craters. Thanks for reminding me, bro. Very informative tips, thank you so much inshallah. I will follow your instructions. Helpful Guide for Authors. It is always about the readers. Thank you for sharing. Thank you for this post. I will definitively put this advice into action with my next articles. :D. Good job, cheers… Thanks. Excellent article, these are the only few blogs which told you information like this. Love to read this special post. A treasure…in a Resource box. Pats for the good post on RB. For a beginner, it’s a milestone in learning the tricks of writing effective articles. Really Useful. I have implemented it for the resource box and it worked Well. Thanks Derek for the post on the Do’s and Don’ts of a writing for a resource box, its quite timely as it came at a time that I was submitting a new article. It really did help in directing me on how to go about it. Very nice article. I enjoyed reading through it. Almost all unique steps you have shared here I have started to follow these & results have automatically came in I’ve sensed. You got the point, before posting an article we need to keep in mind that those words are not for us it’s for those people who read our article. So, it’s better to make it more informative at resource box with original identity. And website’s URL also matter a lot so i am going to optimize my article again. Thanks for the concise info regarding the resource box. I ran into problems when unaware of this info on a previous account. Read your info just before publishing my first post realizing I could put a second personal link and subsequently opted for Twitter. I am now waiting for the review and hoping for the best. Good to note! The ezine article guidelines and etiquette has been a good learning experience. It has also transfered over to my overall writing skills. Thanks Derek for the post on the Do’s and Don’ts of writing for a resource box.